Following an afternoon of bowls, Club President Greg Gourley gathered attendees together in Tuggeranong Vikings Club early in the evening of 10 December 2017 to congratulate all swimmers and coaches on a year of successes – both at individual and club level. At over 100 members, we are one of the largest and most successful Masters Swimming clubs in Australia. 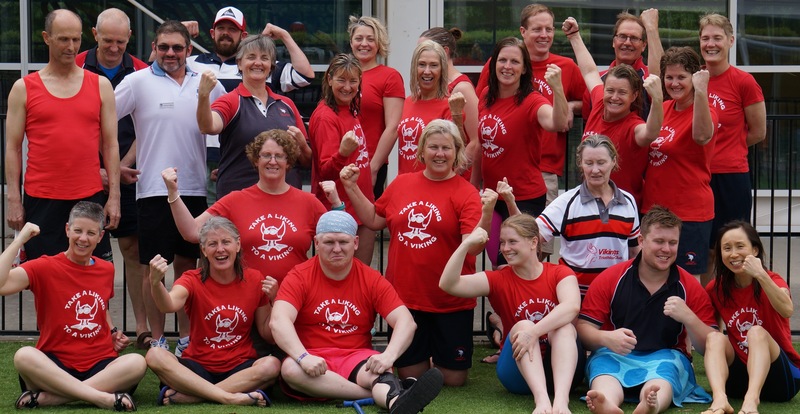 Guided by an excellent coaching team, we have a high participation rate not just at training and at Masters Swimming events, but also at other events such as triathlons and open-water swims. Welcome everyone to the 2017 Tuggeranong Masters Swimming Christmas Party and Awards Night. Thank you to the committee for this hard work over the past 12 months. You and I as club members, benefit from the efforts of a small group of hardworking volunteers – the committee – working behind the scenes. Managing and running the committee meetings, keeping records, managing correspondence, communications to members and managing the legal requirements for the club. The committee is made up of club members. We do try to make the “being on the committee experience” as pleasurable and rewarding as possible. We have a meeting most months and the meetings run for a fixed 1½ hrs. Many meetings involve medicinal food and beverage. I encourage any member who has some time available to consider joining the committee, in that way you can help run the club in the way you want to see it run. We also have assistant positions where one can learn the ropes and also help out. The success of what the committee does can been measured by the size of the club. 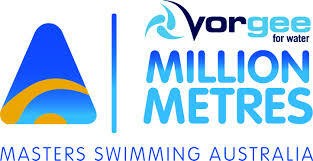 Tuggeranong Masters Swimming Club is one of the largest masters clubs in Australia. Thanks again to everyone on the committee. Sandy Sharman – performing many jobs at swim meets and also helping out at endurance swims. … and all the others family and friends who help out. Now we have ourselves – the members to thank. The club is made up of, and run by its members. The club needs you to join, to train, if you like, to compete and if you can, to be part of the committee. This award is for a Thursday morning swimmer who trains regularly, takes instruction and applies it to the best of their ability, and just plain tries hard but has fun too. 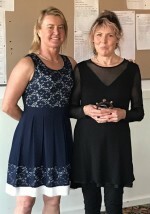 Helen Morris was presented with this award in 2017. 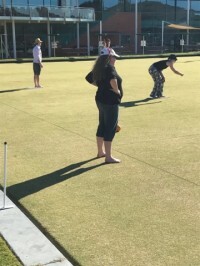 Helen is moving to Sydney next year and we will miss her enthusiasm and friendship, but we believe she will be training with the Sutherland Sandbern Club in NSW – all the best for your move Helen. Introduced in 2013, this award is for an evening swimmer who similarly trains regularly, takes instruction and applies it to the best of their ability, trying hard and having fun. The 2017 award winner was Donna Sims. This award is for the swimmer who, no matter where they’ve started the year, has demonstrated the best continuous improvement. 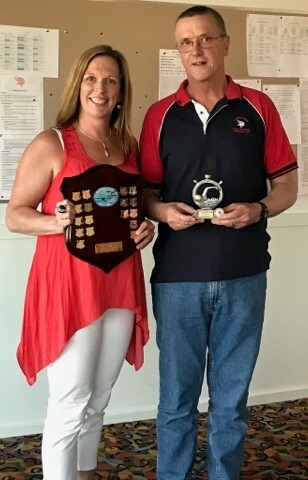 Paul Quinn has been a regular at training and started off an already fast swimmer and has improved his speed thought the year – congratulations Paul …. that 50m Freestyle in 27.something seconds is quick! This award was a new award introduced this year. 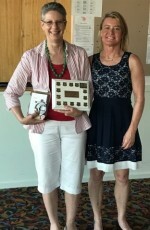 Christine Leary was a very worthy first recipient. We have watched Christine embark on the endurance program and take instruction and tackle the 800m Butterfly .. well done Christine! This award is for the swimmer who has made the best effort at Postal Swims throughout the year. Ann Reid has over the years been a regular top supporter of postal swims, and again this year has entered all postal swims available. This trophy has been around for many many years and is never engraved. Jane Waddleton is the worthy recipient for 2017. 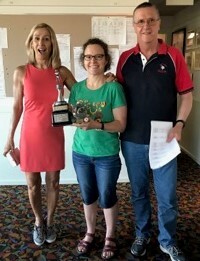 Despite health issues, Jane has continued to train and take part in the endurance program as well as racing in our local ACT Interclub meets, and is about to undergo a hip replacement operation – best wishes for a speedy recovery Jane. Our 2017 Swimmer of the Year is Caroline Makin. 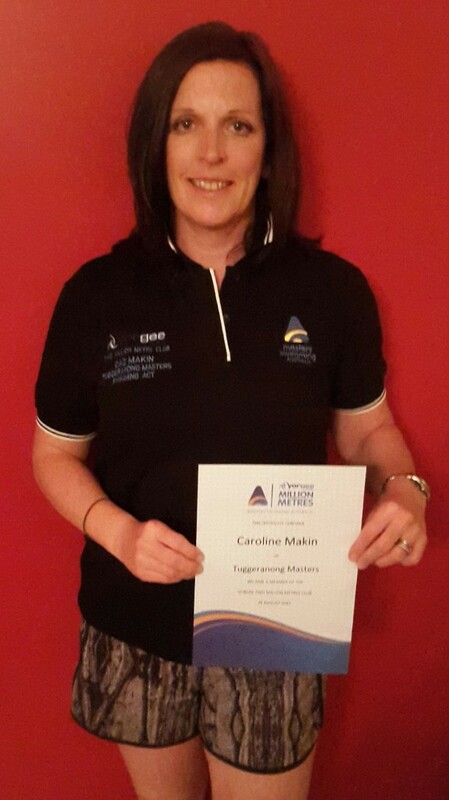 Caz has swum an amazing number of kilometers in competition and endurance this year! She has has had a very successful year with numerous medals and PBs at ACT, NSW State, National and International events during 2017 as well as open water swims not counted in the pool swimming stats … the kilometres stats swum by Caz are big! …. The Mortlock award is for the member who has made the most notable overall contribution to the club during the year. 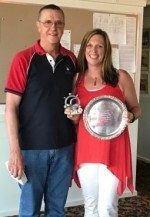 President Gourley was very delighted to present the 2017 award to long time club committee member and holder of numerous roles including Club Captain, Coach, Publicity Officer and Website Editor within the club … Caroline Makin. The ‘LOL’ recognition award was introduced as a fun award this year. There were a few nominations for this award for a LOL moment throughout the year. The inagural winner was Al Byrne. At the NSW State Relay Meet in July 2017, Al Byrne admitted to forgetting to take his watch off before racing and placing it down his budgy smugglers just before entering the pool for a race. Asked if he wasn’t worried it would fall out, his reply was “not to worry when I dived in I made a quick check that it was still there”! Very amusing Al … we love your “timekeeping abilities”!! … and to finish off back where the day started … some bowling action …. 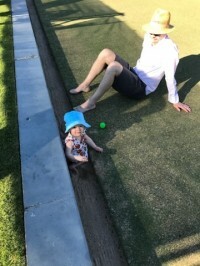 where family and friends joined in the fun! See you all in 2018 for more “friendship, fitness and fun” under the Masters Swimming Australia motto. WOW! What a fantastic venue the Australian Institute of Sport proved to be to swim in for the 2015 NSW State Short Course Championships held over the weekend of 17-18 October in Canberra. 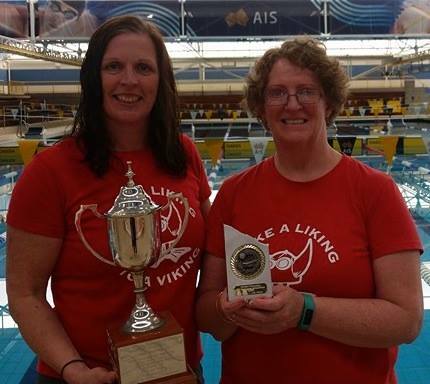 We saw 26 Vikings take to the water to show their skills and determination in the pool, and Tuggeranong fielded a fantastic 18 relay teams across the two days of competition. Our Club President, Leisa Cass, was not swimming but was there the whole weekend supporting our swimmers from the pool deck. We saw lots of significant PBs from our swimmers and witnessed some superb races containing many of our Vikings up against each other in the same heat. Medals were being handed over to our swimmers in bucket-loads during the meet and the Vikings won the meet trophy for highest overall point score. Our new youngster, Maddie Fleming, put in some tremendous swims and significantly bettered her well-thought out entry times for her first official outing as a Vikings “Master” at the age of only 19! She also absolutely loved wearing her nice new blue Speedo LZR race suit!! Another newcomer to racing, Kyle McLean, showed his sprint ability in the 30-34 age group in the 50m Freestyle and Butterfly as well as the 100m Freestyle, although the last 10m of the 100m event certainly took it’s toll and Kylie will certainly be working on sustaining his sprint speed over the full distance! Rachel Harrison-Wyatt punched out quality and quick swims in the 35-39 female 50m and 100m Freestyle, 50m Butterfly and 100m Individual Medley in her first ever State Championships and realised that racing is good! 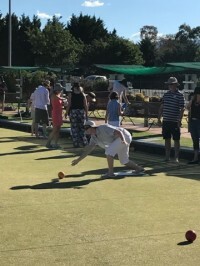 Ed Linder showed us more of his potential as a 50-54 year-old male, bettering the times he set in 50m and 100m Freestyle from his first races as a Viking at The Tuggeranong Challenge in September. He also showed us that he is a pretty good Breaststroke swimmer too. In the 20s age groups, Kade Burgess showed us some good swims in the fastest heats of the days and swam an excellent 50m Backstroke leg in the youngster’s Mixed Medley relay at the end of the first day of competition. 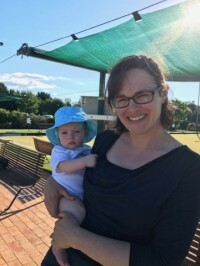 In the 30s age groups, Marianne Tweedie swam on the Sunday only but set three new significant PBs in the 200m Freestyle, 100m Individual Medley and 100m Breaststroke. Tara Olsthoorn was back racing properly after having a baby in January and showed she has worked hard in and out of the pool to regain her form with good swims across her five events, and showing her strength in the 200m Backstroke. Nick Dando came home strongly in his 200m Breaststroke and went out quickly in his 200m Butterfly producing solid performances in both swims. Atsuko McGowan swam on just one day and as usual looked graceful in her two Backstroke swims and swam a nice 100m Freestyle. In the 40s age groups, David Bale showed us how solid a Butterfly swimmer he is with a nice time in the 100m event and backing up with a good 200m Butterfly at the end of day 2, looking strong the whole way through. Caroline Makin‘s quick 200m Individual Medley produced a time that was over three seconds faster than her PB set at Nationals in April and then she followed that up by bettering her 100m Freestyle PB yet again this year. Katrina Burgess‘s 200m Backstroke was a superbly executed and fast swim knocking four seconds off her PB and then she took her 200m Individual Medley swim below three minutes for the first time, for another PB. In the 50s age groups, Nicolee Martin displayed her Freestyle skills and speed in the 100m and 200m events matching her times from Nationals in April and finished off the meet with a one and a half second 100m Breaststroke PB. 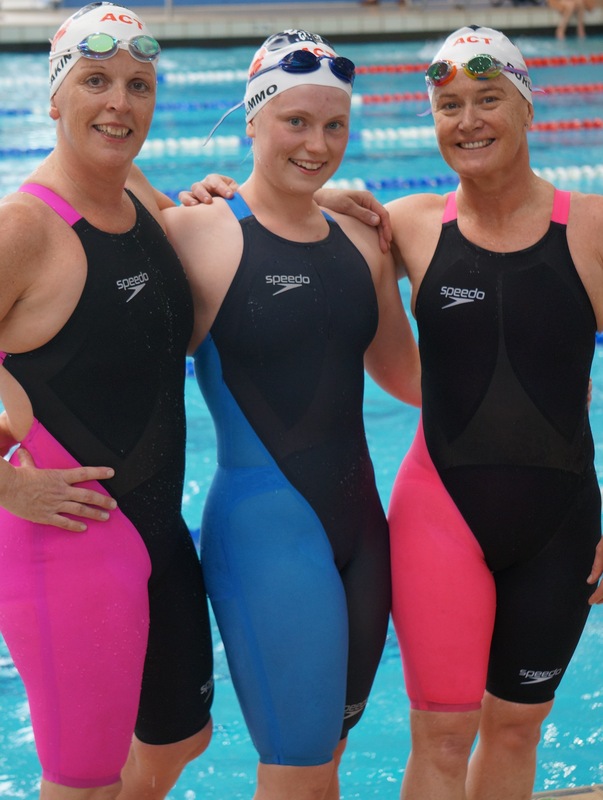 Donna Campbell showed her cross-training in the gym is paying off, with five more PBs in her 50m swims and 100m Individual Medley and Ann Reid swam excellent 100m and 200m Freestyle swims recording times quicker than any recorded in the last three years by her in those events. Suzie Gunning swam on just one day completing three events including a good 100m Individual Medley which highlighted that Suzie is not just a Freestyle swimmer! 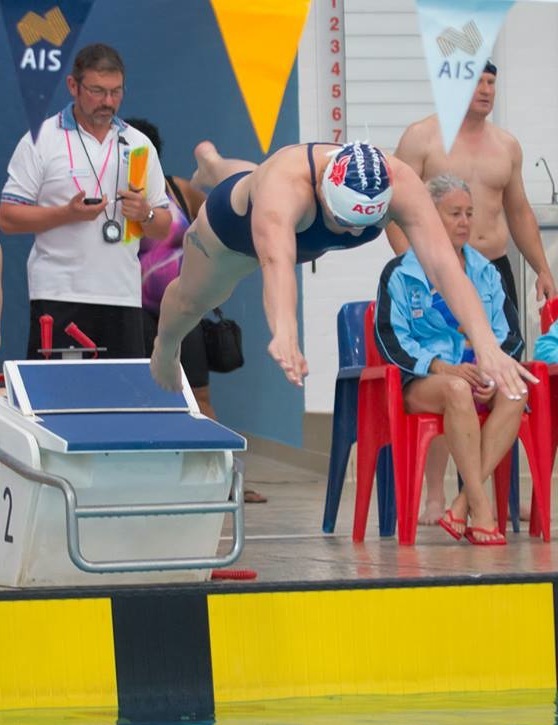 Jane Waddleton overcame the nerves of competing in her first State Championships and displayed some lovely swimming in her favourite stroke, Breaststroke across all three distances and achieving a 100m PB time and even taking on a relay leg, which normally Jane does not like to do. 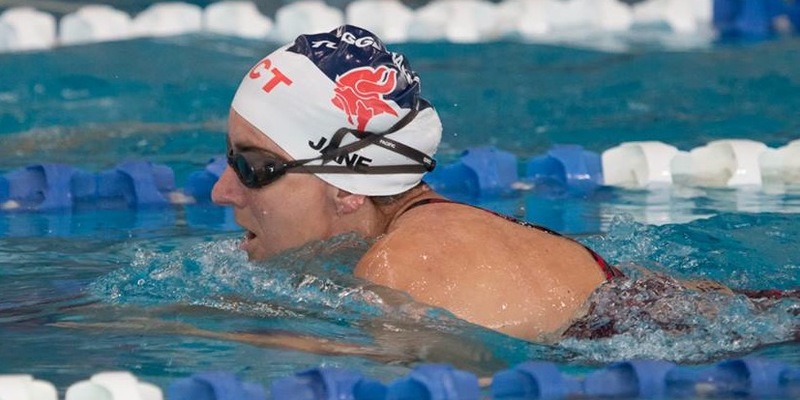 Jeanette Droop showed what a solid all-round swimmer she is and bettered her entry times on all five swims. Anne Smyth looked as powerful as ever, and showed smart swimming and consistency across her events as usual, including the 200m Butterfly! 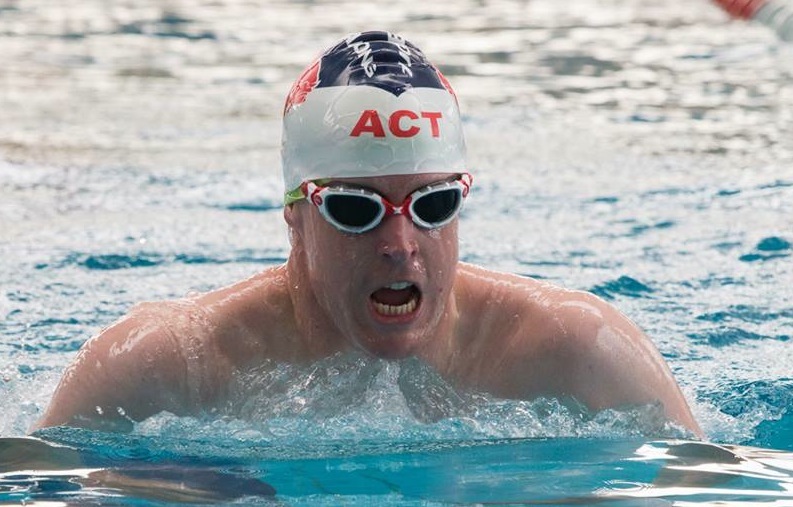 Tom Boyce was suffering from a recent rotator cuff injury so had to withdraw from his individual swims, but still turned up to do four relay swims for his club … what a great effort from Tom! 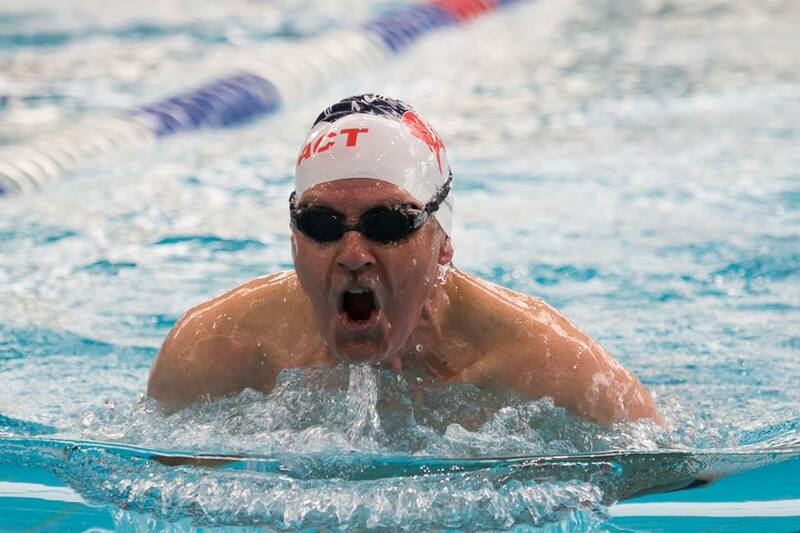 In the 60s age groups, Richard Flockart was pretty much on par with his form from Nationals six months ago with some equally good times and swimming his quickest 100m Individual Medley time since 2013. Cecelia Kaye showed consistent performance across her swims with a nice time in the 50m Breaststroke event whilst Denise Druitt was another newbie competitor who took on the challenge of her first State Champs swimming the 50m and 100m events plus a Freestyle relay swim and thoroughly enjoying the whole experience. Seasoned competitor Jon McRae punched out nice quick swims in the 100m Freestyle and 100m Individual Medley. Brenda Day swam a lovely 200m Individual Medley to start off her weekend of swimming and also a good 100m Backstroke. It was great to have our “Veteran Master” of swimming, Ian Hampton back racing with us after much travelling and his usual winter break from the pool, and we saw a him putting in solid swims as always, with a nice 50m Breaststroke in particular. What a fantastic weekend of swimming at a magnificent venue. We loved welcoming all our swimming friends from all the clubs around NSW to the Nation’s Capital for what proved to be a great State Championships. CONGRATULATIONS TO ALL YOU VIKINGS!! !